Heritage lines survive on the goodwill of thousands of volunteers — but they also need financial backers. Anyone looking for an investment to be enthusiastic about should venture into new territory — by steam train. 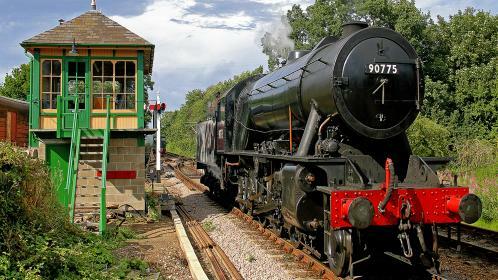 It’s easy for Londoners to travel on the Bluebell Railway in Sussex because the heritage line to Sheffield Park runs from East Grinstead, with direct rail connections to the capital. In less than one hour from Victoria station, you can transfer from your bland modern train to a Pullman carriage and steam away into idyllic countryside. The extension to East Grinstead, like many big projects in heritage railways, was part-financed by a share issue, with 1,100 supporters buying £670,000 of shares eight years ago. Heritage railways are not listed companies and their shares are not a traditional investment — you should look at mainstream FTSE-listed shares if you want capital gains or income — but they provide a way to support a good cause, buy into Britain’s industrial history and qualify for travel perks. There can be tax breaks too. The Bluebell Railway is encouraging supporters to give money rather than buy shares, but with the heritage railway sector doing well and many of the 100-plus lines seeking to expand, there are plenty of opportunities for steam enthusiasts to buy shares and back exciting projects. Peak Rail, a heritage line that operates steam and diesel services on a three-and-a-half-mile track between Matlock and Rowsley South, in Derbyshire, is looking for shareholders. The management is examining the options for extending the line, ultimately reopening the 18-mile Matlock-Buxton line that used to run through the Peak District National Park. Shares cost £1 each and, besides helping the railway, shareholders receive a share certificate and the right to attend the annual meeting and vote on company business. There are also travel benefits, such as one return ticket a year for holdings of 25-49 shares, to a transferable lifetime pass and family discount at 1,000 shares-plus. An adult ticket usually costs £8.50. Paul Tomlinson, the project development director at the railway and a shareholder, says: “People mostly buy the shares for sentimental reasons — they remember travelling on the line years ago or they love steam trains. Our shareholders’ financial support is absolutely vital, our oxygen, and we’ve used share issues to finance major projects. You can transfer or bequeath heritage railway shares to other people, but they are not a liquid investment and you may be unable to sell them. It’s therefore best to see your share purchase as a gift and assume you won’t get your money back. Likewise shareholders may theoretically qualify for dividends, but these aren’t normally paid because profits are reinvested. Some heritage railway share offers qualify under the enterprise investment scheme (EIS) for tax relief of 30 per cent for eligible taxpayers. You might be able to buy £1,000 of shares, with a tax reclaim of £300, effectively paying only £700. The Gloucestershire Warwickshire Steam Railway (GWR) is looking to raise £1.25 million in an EIS-qualifying share issue to extend the line to Broadway, one of the tourist hubs of the Cotswolds. Shareholders in the railway, which runs from Toddington to Laverton and Cheltenham Racecourse, qualify for three round trips a year with 100-499 shares at £1 a share, or free unlimited travel for the shareholder and three guests at 5,000 shares or more. Perks vary between railways, but you can often get several free journeys a year for a few hundred pounds upfront. Trevor Eady is the general manager of the North Norfolk Railway, which runs steam trains from Sheringham to Holt and offers unlimited travel for its shareholders and a guest if they have 1,000 shares at £1 apiece. He says shareholders get great value for their money, which will help to fund a canopy and restoration work at Sheringham. There are hundreds of heritage and preserved railways across the UK and Ireland that would welcome your support — for a list and contact details go to heritage-railways.com.